"I came from Haiti. I have been painting since I was a child. 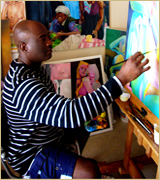 Upon completing my Visual Arts degree in the Arts National School in Haiti, I have immersed myself in my art. I have been painting professionally for more than 20 years. On the side, I draw with the pencil and paint in soft pastel. I also paint in both, oil and acrylic. Sometimes I paint realistic images of people participating in every day activities, but sometimes my artist approach is surrealist or abstract. It all depends on what I want to do and on the technique I’m using. When I paint figurative compositions, I often resort to photography. For surrealist or abstracted subjects, anything can inspired me. When I paint, I like listen to music. My preferred colors will vary according to the subject and the way I feel. 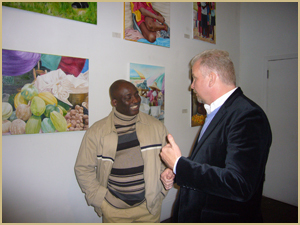 As an artiste, I actively participate in diverse arts events. I am a member of several arts organizations including ICAA (Immigrant Culture Arts Association), BRAVO (Bureau des regroupements des artistes visuels de Ontario) and Théâtre de l'atelier 83." From a young age, it was his habit to paint whatever he could see or feel. Since then, Frantz Jean-Baptiste never stopped to do it ardently and passionately. With origins from Jeremie (Haïti), he completed his studies at ENARTS (Arts Plastiques à l'École Nationale des Arts). His painting is based strictly on a harmony of colours and represents his way of conceiving the life and the painting in a parallel and complementary vigour. Frantz has multiples artistic gifts. His subjects vary, but a major part of his work is figurative et naive painting. His motifs include people in everyday situations, portraits, landscape... One of his favorite themes is women working. 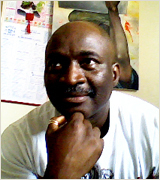 Frantz regularly presents his works worldwide. 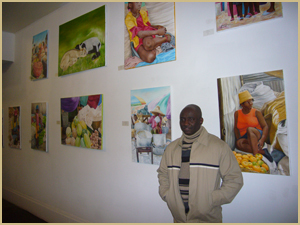 He participated in collective and individual exhibitions in Canada, U.S.A, France and in Antilles.